In Ephesians 4, Paul's vision of the church is where every single member "speaks the truth in love". However for many, our Sunday conversations rarely get past the weather, sport or what we did yesterday. And though there's nothing wrong with this, it's a bit of a pity. Especially when we are allowed in fact, we're commanded to speak God's life-transforming word and thereby encourage each other. So what is 'encouragement' exactly? And how does it work? In Encouragement: How Words Change Lives, join Gordon Cheng as he explains what encouragement is and how all of us can make one simple and foundational contribution to church life by encouraging others. The latest in our Guidebooks for Life series, this easy-to-read book is sprinkled with humour, insight and practical wisdom. More importantly, you'll discover how encouragement is not only central to our church life, it is part of one of the most powerful themes in the whole of Scripture: the power of God's word to change lives. 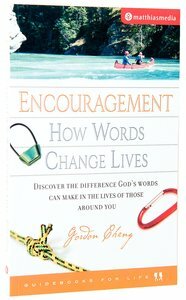 About "Encouragement - How Words Change Lives (Guidebooks For Life Series)"
Gordon Cheng was ordained in the Anglican Diocese of Melbourne and worked for ten years as a senior staffworker with the AFES at the University of Melbourne, and then ministered at a number of churches in Sydney. He is the author of several books and other resources published by Matthias Media, including the Pathway Bible Guides Bible study series, and his first book/multimedia publication with Matthias, the Six Steps to Encouragement course. This short book explores the joy and the struggle of the ordinary Christian life. Veteran Australian evangelist John Chapman draws on years of personal reflection and experience to provide this treasure trove of wise counsel and encouragement. John Chapman combines biblical substance with warm, practical teaching to provide a classically simple, challenging call to holiness; its beginning, progress and fulfilment. Ideal for group or personal study, the book includes a discussion guide. In this handy guidebook, veteran ABC broadcaster Kel Richards provides clear, convincing responses to the most commonly encountered objections to the gospel. Using the popular tract Two Ways to Live as a framework, Kel has produced a warmly engaging resource that will equip Christians to communicate their faith with confidence. Everyone knows that faith is central to the Christian life. what difference should our faith make to everyday life? In six short chapters, Bryson Smith takes us on a climb - a climb to look out at the magnificent wisdom of God and understand faith in all its glory. In the course of this journey, we start to grasp what a life of faith looks like and why faith is more precious than gold. This book is the latest in Matthias Media's 'Guidebooks for Life' series. Like other titles in the series, it covers an important issue of the Christian life in an accessible and straightforward way. Guidance and the Voice of God has recently been added to Matthias Media's new series: Guidebooks for Life. As the series unfolds, it will deal with the important nuts-and-bolts topics that Christians need to know about as we walk each day with our Master. How can I make decisions which are in line with his will? If God still speaks, will I recognize his voice?